Shawn Doyle (@Motiv8er on twitter) returns to discuss grief with host Craig Price. Grief can be a painful subject, awkward to address and difficult to understand. That’s why Craig thought Shawn and his new book “The Sun Still Rises: Surviving and Thriving After Grief and Loss” should come on the podcast. The two discuss the shocking and unexpected loss of Shawn’s first wife Cindy and how Shawn coped in the aftermath. Shawn offers up some suggestions to people trying to support those in grief, how grief is contextual and personal as well explains the path that allowed himself to find happiness. Every day, many people lose loved ones and face the grieving process. They suffer while coping with the loss of a child, spouse, parent, friend, or sibling. It is perhaps the most difficult and devastating challenge any of us face in our lifetime. Shawn simply tries to offer his first hand experiences to others in hopes they to can heal. 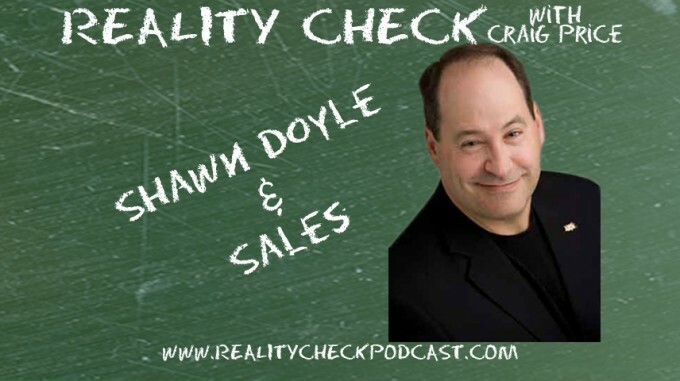 Shawn Doyle, sales expert from New Light Learning and Development, sits down with a frustrated Craig as they talk sales. Shawn tries to get Craig over his disdain for sales, all while trying to sell Craig’s own book to him! They touch on prospecting, NASCAR, following-up and why you need to know so much before you even make a sales call. Shawn can be found on twitter @Motiv8er as well as his website http://www.sldoyle.com/. Also look for his new book The Soul Survivor in stores now!